This plugin is great, but it seems to scrub the NBT data of any spawner I pick up. ^ That spawner spits out mobs like crazy, thanks to the delay settings. If I mine this spawner and replace it, it defaults back to the slow, normal rates. This means the plugin is scrubbing the nbt data when I mine / pick it up. Any chance for an update or option to disable this? SilkSpawners should retain the NBT data that are present on a spawner. I'll check this out, thanks for the pointer. I'm having some problems. I can't place/mine spawners while de-opped. Do I need to input something in the coding, if so please let me know. If not, then what am I doing wrong? I also did input the coding using PermissionsEX. Setup the correct permissions - silkdrop or destroydrop. I did. Would I have to create a new .YML file or how would I input it? I used PermissionsEx to do it. Can you make it to where any tool that has silk touch on it works? Thanks! You can configure the tools via the config file in the "allowedTools" section. I having a problem when placing spawners, when i place a chicken spawner, the spawner changes to PIG. EDIT: I see your other comment, tryng the latests builds of MC. 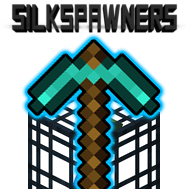 Hello, I have used this plugin before and never ran into any issues, but I was trying to use a 1.8 version of silkspawners, and it was working fine regularly. but every time I edited the config, it wouldn't let me do /spawner (Mob) to get a spawner, I could only turn other spawners into whatever mob I put in after /spawner. Also, even if I don't edit the config, it doesn't show the spawner ID. Delete your config.yml once and try to redo the edits. Does this solve the problem? No, When I delete the the config, it doesn't create a default one if I reload or restart. I believe the issue is with another plugin, but I have no idea which one. If you have someone listed as a member in a WorldGuard region, spawners will only work properly for that member and opped players.